Compartment syndrome is much more serious than its name implies. Groupings of muscles, tendons, nerves, and blood vessels in the trunk and limbs (arms and legs) of our body form “compartments” and are held together and covered by membranes known as fascia. 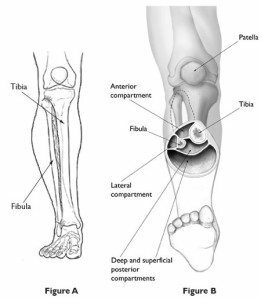 Compartment syndrome is a medical condition that occurs when excessive pressure builds up within these compartments inside the body, typically as a result of excess internal bleeding or swelling. This excessive pressure compresses nerves and reduces the flow of blood to and from areas of the body. Over time, this can result in severe nerve damage and potentially permanent injury due to lack of oxygen flow to various parts of the body. The most common areas of the body affected by compartment syndrome are the legs, fee, hand, and arms. If not treated quickly and properly, compartment syndrome can lead to permanent damage, amputation of limbs, or death. While there are many types, acute and chronic are the most common. Compartment syndrome is often described in various degrees, and can include a wide variety of symptoms, including severe pain in the area of the affected body part, prickly sensation throughout the affected area (also known as paresthesia), not having a detectable pulse in the affected area, paralysis in the affected limb due to dead muscle tissue, and welling that becomes hard and dry due to the lack of blood flow. Because a patient’s right to bring a medical malpractice lawsuit based on a medical error is limited in time, once a potential error is uncovered, it is extremely important to contact an experience medical malpractice attorney as soon as possible. Know your rights. If you or a loved one has been the victim of a medical error that resulted in injuries from compartment syndrome, call the experienced medical malpractice attorneys at Powers Taylor for a free consultation. All calls are confidential.